Yes, that’s right folks- boat tattooing. 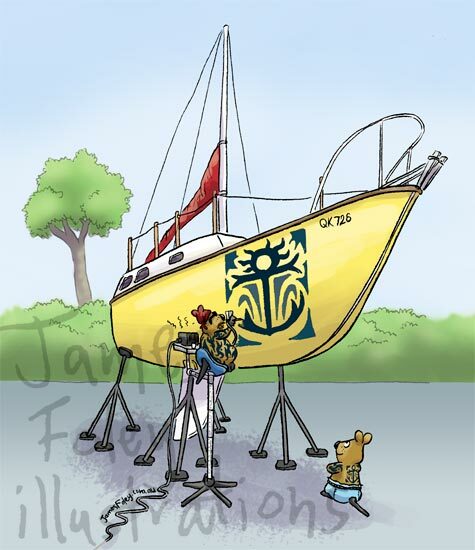 A new advertiser in the Quokka is painting tattoo designs on boats. This has got to be the weirdest request for a cover I ever received. I tried to make up some sort of tribal-inspired anchor. Bit random, but a huge flaming skull probably wouldn’t have gone down too well. Giant flaming skull!!! Giant flaming skull!!! Or possibly, a boat tramp stamp? Or a giant heart with “Mother” written inside? Or… Mebbe I should go have a lie down, hee hee.